Standards of care for congenital myopathy A publication for healthcare practitioners by an international collaboration of researchers sharing best practice on standards of care in congenital myopathy (2012. Updated 2018). The Care of Congenital Myopathies – a Guide for Families A patient friendly version of the ‘Standards of care for congenital myopathy’, this guide covers all aspects of living with a congenital (born with) myopathy, but also includes information about nutrition, exercise, transition to adulthood, amongst other topics. It has been written by an international group of parents and researchers, including some parents of children with myotubular and centronuclear myopathies. (Updated 2018). It is not unusual for people with myotubular and centronuclear myopathies to experience breathing problems. Mostly all children who present with symptoms of severe muscle weakness from birth will require support with their breathing for some hours of the day and/or night. Invasive ventilation is when breathing support is delivered via a tracheostomy – a small incision by surgical procedure into the windpipe. Non-invasive ventilation is when breathing support is delivered via a nose or face mask. Getting on top of breathing problems can really help to improve quality of life. It is especially important that children and young people have a good multidisciplinary team regularly involved in their breathing care, especially to help through periods of rapid growth or changes in physical ability. Older children and adults who have not previously needed breathing support are advised to be aware of the signs of poor breathing function. They will also need access to modern equipment to help them manage good airways clearance and maintain good breathing support. Airways clearance techniques in neuromuscular disorders: a state of the art review (full version). This very welcome and long awaited resource is an international review of the best evidence available on airway clearance techniques in neuromuscular disorders. Written by a group of 21 international experts in this field, it is all encompassing in its review, from published research to patient case studies. (Open access sponsored by Myotubular Trust). For further advice on getting patients home from hospital either as a patient, carer or professional, please take a look at the Royal Brompton Hospital website. Getting your New Baby Home From Hospital – A Royal Brompton Hospital, London film about the transition from hospital to home, In this short film three families, including the parents of Baby Elijah who has myotubular myopathy, talk about the Long Term Ventilation team helped them to be able to get their baby home from hospital safely, smoothly and within a matter of months. The accepted standard feed for patients is still liquid, nutritionally complete, pre-prepared commercial feed which is sterile, standardised and easy to prepare and administer. However, there is currently increasing interest in the use of liquidised food (blended/ pureed, ‘table food’), both in addition to and as a replacement for commercial feeds. There are anecdotal reports of benefit, and little evidence of harm. However, there is at present little robust research evidence to support this practice, so as yet it cannot be formally recommended. Another recent publication explores paediatric dietitians’ perceptions and experiences of blended tube feeding use – Dietitians’ perceptions and experience of blenderised feeds for paediatric tube feeding. Suzanne Brown, a children’s nurse and member of the care team at the Children’s Hospice South West Devon, explains in this article how one hospice has helped families to provide children with a blended die, while ensuring they are aware of the risk factors. A UK website about blended diet written by a grandmother to support parents and carers, with lots of personal but helpful advice for other families who are thinking about starting their child on real food. Other recommended reading regarding home blended feeding includes two books entitled Complete Tubefeeding: Everything you need to know about tubefeeding, tube nutrition, and blended diets which has been written by Eric Aadhaar O’Gorman (2011) who is himself tube fed and is very informative and helpful. Homemade Blended Formula Handbook Paperback written by Marsha Dunn Klein and Suzanne Evans Morris (2017). Scoliosis (derived from the Greek word meaning crooked) is a medical condition in which a person’s spine is curved from side to side. Although it is a complex three-dimensional deformity, on an X-ray, viewed from the rear, the spine of an individual with scoliosis may look more like an “S” or a “C” than a straight line. Scoliosis is typically classified as either congenital (caused by vertebral anomalies present at birth), idiopathic (cause unknown, subclassified as infantile, juvenile, adolescent, or adult, according to when onset occurred), or neuromuscular (having developed as a secondary symptom of another condition, such as myotubular and centronuclear myopathy). About 3 out of every 100 people have some form of scoliosis, though for many people it’s not much of a problem. 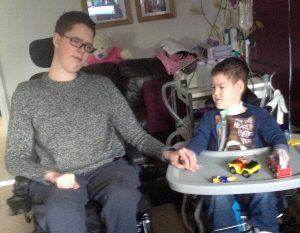 For a small number of people, and sometimes children and young adults with neuromuscular conditions in particular, the curve gets worse as they grow and they may need an operation to correct it. While small curves generally do not cause problems and may not be very noticeable to others, larger curves can cause discomfort and lead to respiratory problems when the lungs become compressed. In 2011, Myotubular Trust joined up with USA patient organisations Joshua Frase Foundation and Cure CMD to arrange two web presentations (webinars) – one is on Scoliosis and one on Respiratory Management, to help inform patients and families with myotubular and centronuclear myopathy and congenital dystrophies. Part 1: Pediatric Pulmonologist Hemant Sawnani, M.D., Cincinnati Children’s Hospital Medical Center: How we breathe and what goes wrong in congenital muscle disease? There are a number of other UK based organisations which provide advice and factsheets on living with a disability. The following resources provide advice on emotional support, financial matters, grants, housing and equipment. If you need friendship, information or advice, please always feel free to get in touch with us at contact@myotubulartrust.org and we can help.